Born in Salt Lake City to a large Greek family, Chef Elias Cairo started his culinary education early. From his family, he learned traditional Greek butchering and preserving techniques which sparked his lifelong interest in meat. 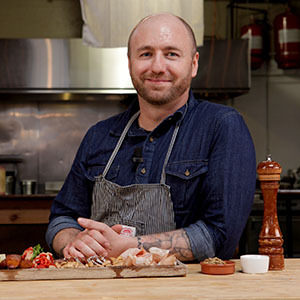 He started the award-winning, Olympia Provisions in 2009, Oregon’s first USDA-certified meat-curing facility, which is also a European style restaurant. Olympia Provisions has received rave reviews from Food & Wine magazine, Oprah, Saveur, and Bon Appetit and won the 2013 Good Food Award for charcuterie. After working in his father’s restaurants growing up, Chef Elias worked as an apprentice to Chef Annergret Schlumpf in Switzerland, starting at age 20. During his time in Switzerland, he learned classic culinary techniques with a particular focus on butchery and charcuterie. After working in Greece, he headed back to the United States and began working as a line cook at Portland’s distinguished bistro Castagna where he quickly worked his way up to Sous Chef. Chef Elias has a passion for creating delicious meats and charcuterie and has turned that passion into a thriving business. One basic preparation with a few additional steps results in two delicious and meaty dishes. Learn how to balance flavors and textures to create the perfect charcuterie board.